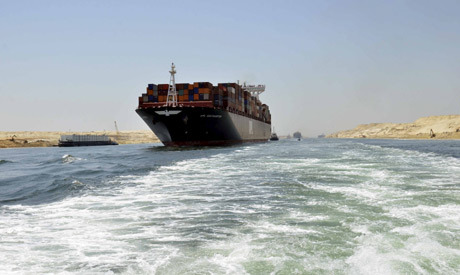 Al-Ahram: The new Suez Canal waterway is a major achievement, one that is bound to benefit both the Egyptian economy and world trade. How would you assess the project? What part is Russia planning to play in the opening ceremony for the new waterway? Dmitry Medvedev: The construction of the new Suez Canal waterway is a grand national project for Egypt and a significant event for the world's shipping industry. This route has been known since the days of antiquity. Today, its importance for international trade is no less great. It connects oceans and continents, making distances between countries shorter. I would say this is one of the symbols of the modern global world. The Egyptians have shown genuine patriotism by responding to the call by the country's leadership to raise funds for the canal’s modernisation. The Egyptian engineers, who carried out very complicated work on the canal and in the area in just a year, deserve great respect as well. All this speaks to the fact that the project really enjoys both demand and broad public support. The almost twofold increase in the canal’s throughput capacity and its ability to take large vessels will undoubtedly contribute to an increase in the overall volume of maritime trade. Over time, this will transform the appearance of the surrounding area of ​​the canal. New economic zones will emerge along it, creating more points of growth for the Egyptian economy. By the way, this year, Russia launched its own major project: the comprehensive development of the Northern Sea Route, the shortest route from Europe to the Asia-Pacific region. This is yet another way to optimise international freight traffic. I believe that the general benefits of such projects are obvious. Russia is an old friend of Egypt. I have gratefully accepted the invitation to take part in the opening ceremonies for the new canal. I am accompanied by representatives of several Russian ministries and large companies that operate on the Egyptian market. I think this delegation is impressive, and will demonstrate our commitment to developing mutually beneficial cooperation. The opening of the new Suez Canal is certainly a very important event for our country. But it is only one of the pieces of the multi-coloured mosaic of our bilateral relations. We have traditionally friendly relations. We share similar approaches to most international and regional issues. Russians have sincere respect for the Egyptian people, we love to travel to your country, and take great interest in its culture and history. I do believe that everyone must visit Egypt, the cradle of civilisation, at least once, to see its ancient monuments with their own eyes. But I must say that modern Egypt is no less interesting and dear to us. I know there's an Arab saying: if things are good for your neighbour, they’re good for you too. Even though we do not have common borders, we are always happy for your achievements and successes. Al-Ahram: The Egyptians still recall with gratitude Russia’s role in building the Aswan Dam. To what extent will Russia be involved in projects to build a new Suez Canal zone along its course? Dmitry Medvedev: As I mentioned earlier, relations between Russia and Egypt have a long history. Primarily, these relations are based on mutual assistance and support. That's how many major Egyptian industrial facilities, including the Aswan Dam, were built. This has become a vivid example of the cooperation between our countries. Last year, we marked a key event in this joint construction effort: the 50th anniversary of the completion of the first dam construction stage when the Nile River was shut off. This is by far not the only example. Other major infrastructure facilities were built in Egypt with the involvement of the Soviet Union as well. I believe that those who have worked on those construction sites will keep their warm feelings and trust in Russia forever. As they say in the East, although real friends are hard to come by, it’s impossible to forget them. Such experience of joint efforts is very helpful. Far from all countries have this. Upgrading the canal involves carrying out a set of projects not only to develop transport and logistics infrastructure, but also to create additional capacities in industry, agriculture and the social sphere. It’ll take several years to develop the adjacent area. In fact, it’s a new starting point in developing Egypt's economy and expanding international cooperation with partners. Our companies are willing to participate in these economic projects. Creating a Russian industrial zone in the Suez Canal could be the first step in this project. This issue is now being actively discussed at the ministerial level. Work is underway to develop a concept for this project, taking into account the market needs of Egypt and other Middle Eastern and African countries. The next meeting of the bilateral intergovernmental commission is slated for December. I think that by that time we will have a good and thorough understanding of how the entire project will work. We expect to sign a bilateral memorandum of understanding and a roadmap for its implementation. Al-Ahram: How would you assess relations between Russia and Egypt following official visits by both President Putin and President Abdel-Fattah El-Sisi and the agreements on economic cooperation and arms supplies that were signed later? Dmitry Medvedev: You're absolutely right. We maintain a constant and intensive political dialogue. Suffice it to say that we have held three meetings at the highest level over the past 12 months. We have signed major agreements in various areas, including the economy, the cultural sphere, and military and technical cooperation. Importantly, these agreements are mutually beneficial and are based on the interests of both sides. Mutual trade is on the rise, reaching, according to the Russian customs office, $5.5 billion in 2014, which is almost twice as much as in 2013. Russian exports have doubled to $4.9 billion, while imports were up by almost 25 percent. We are discussing new joint projects, including in high-tech sectors, such as heavy and light industries, conventional and renewable power engineering, transport engineering, agriculture, the telecommunications sector, pharmaceuticals, medicine and education. Just last year, about 1,500 companies and entrepreneurs asked Russia’s trade mission in Egypt for assistance in establishing contacts with prospective partners. That’s twice as many as in 2013. There were over 1,000 such requests as of early July. I hope that specific agreements and contracts that will improve people’s lives both in Russia and Egypt will be signed soon. Let me give you another example, which speaks volumes about our mutual desire to expand trade and economic ties. A major Russian business forum — Industrial and Commercial Dialogue: Russia-Egypt — was held in Cairo in May. It was attended by over 200 businesspeople from Russia and 300 corporate representatives from Egypt. An agreement to start creating a joint investment platform was one of the key results of this meeting. Its specific parameters are already being discussed. Military and technical cooperation is, of course, important for us. However, I want to point out right away that it is not directed against other countries. Primarily, the issue is about strengthening Egypt’s defence capabilities, including its ability to deal with the threat of terrorism, which means greater stability and security throughout the region. For obvious reasons, I won’t disclose the details. I’ll just say that several promising contracts are in the works, including on potential supplies of aircraft, helicopters, armoured vehicles and warships. Hooking up our Egyptian partners to GLONASS (Russia's version of GPS) is another important issue. Al-Ahram: Russia is once again playing an important role in the modernisation of Egyptian industry. What are the prospects of this role and what is necessary to intensify partnership in this area in the coming years? What plans are there to increase the trade volume? Dmitry Medvedev: In my opinion, Russian-Egyptian cooperation in the industrial sector has huge potential, which has been barely tapped. The Soviet Union was active in developing trade and economic relations with Egypt. About a hundred industrial, energy and agricultural enterprises in Egypt were built with Soviet technical assistance. Besides Aswan, there are other widely known successful projects, such as an aluminium smelter in Nag Hammadi, the Alexandria shipyard, the Helwan steel plant and others. And many of them are still using Soviet and Russian technology. These facilities are now being overhauled and modernised. The unique experience of Russian heavy engineering, metallurgy and energy industries could be used to perform this large-scale project more efficiently. We could offer a range of services to our Egyptian partners, including design and construction of industrial facilities, joint production and supplies of various types of equipment, as well as the necessary technical assistance. There is yet another area of cooperation. We plan to significantly increase the export of Russian grain to Egypt, to 6.5-7 million tons a year. Accordingly, there is a real need to expand the Egyptian grain storage and processing infrastructure. Our companies have sufficient design, technological and production resources, and they are interested in participating in the construction and modernisation of grain elevators, mills and feed plants in Egypt. It is important that the interests of both sides are represented in joint investment projects. I've already mentioned plans to create a Russian industrial zone in Egypt. I’d like to say a bit more about this. Among its potential residents are automakers, manufacturers of building materials, river and sea transport companies, and energy equipment and pharmaceutical producers. Of course, the launch date of the industrial zone does not depend on the Russian side alone. All investors want to have complete and timely information on the cost and conditions of obtaining land, the available utilities, local land development plans, and existing administrative, tax and customs regimes. We hope that our Egyptian partners will provide our investors with the necessary support. Speaking of mutual trade growth prospects, of course, they depend on both sides. Egyptian agricultural products, such as potatoes and citrus fruit, have been well known to Russian consumers for many years and enjoy high demand in our market. But I'm sure that our countries are equally interested in supplying other products as well. There is excellent potential to increase the supply of agricultural and road-building equipment, rolling stock and various components. A free trade zone between the Eurasian Economic Union and Egypt would also provide good opportunities for the development of trade and investment. Our experts are currently exploring the possibility of signing an agreement. Our common goal is to create the most comfortable environment for businesses, allowing them to fully utilise these opportunities. Russian ministries and departments are now busy working on this. I think that the business community and representatives of the regions should be more actively involved in this process. I hope that Egypt shares this view. Al-Ahram: Russia is one of the leaders in nuclear technology. Moscow has repeatedly pointed out that it’s willing to help Egypt build nuclear power plants to generate electricity. Do you think that time is ripe to implement these projects, especially given how fast the Egyptian economy is growing? Dmitry Medvedev: Nuclear power engineering is a strategic area of Russian-Egyptian cooperation. I’m not overstating it. Russia is willing to help Egypt become a regional leader in the nuclear industry. Specific agreements were reached during President Putin’s visit to your country on 10 February, when an agreement on developing a project to build an nuclear power plant (NPP) in Egypt was signed. Technical specifications and the number of nuclear power units, as well as the key commercial terms, have been agreed upon. They will be included in a new intergovernmental agreement, which is almost ready for signing. Russia can supply the latest power units to Egypt, which are equipped with the safety systems that were developed following the Fukushima-1 accident. New nuclear projects in Iran, India, China and other countries are built under the same projects. We hope that the document will be signed during the next bilateral meeting at the highest level. The oversight authorities of our countries are working on drafting a memorandum of cooperation in nuclear energy infrastructure. Moreover, our respective finance ministers are conducting intensive consultations on another intergovernmental agreement, which will make a Russian government loan available to Egypt. Russian and Egyptian companies are already busy preparing a package of contracts for the NPP construction. What does this mean for your country? This project will create thousands of jobs, and provide a large order for Egyptian industry and the construction industry. They are expected to be signed this autumn. We will also provide broad opportunities for academic and hands-on training of Egyptian specialists at Russian nuclear facilities. We will help your country to train personnel for a future nuclear programme. About 50 Egyptian students will start training at Russian universities in various professions this year already. Al-Ahram: With regard to combating terrorism, both countries share the same vision regarding what’s happening in the Middle East. What joint actions will be taken in combating terrorism, and how close are Russia and Egypt in the international arena? Dmitry Medvedev: Terrorism remains the most terrible global threat today. Its ideology instils fear and loathing, and denies the value of human life, both that of the terrorists and of others. Terrorism transcends nationalities, religions and borders, so it represents an equal threat to all countries and nations. It requires joint efforts on behalf of all states. Russia and Egypt are allies in combating terrorism and radical Islam. We share the understanding that we can confront this evil effectively only if we stand united. It is essential that such interaction is based on strict observance of the principles and norms of international law, including the UN Charter, and is free of double standards. This is the basis of Russian-Egyptian international anti-terrorism cooperation, primarily in the United Nations. We are actively involved in work in the priority area of fighting “foreign terrorists and militants.” Our countries negatively view attempts to arbitrarily interfere, under the guise of some geopolitical goals, in the domestic affairs of other states using radical groups. Not only does this not reduce the threat of terrorism, but, conversely, it leads to nurturing new extremist and terrorist forces. We have a bilateral working group on combating and countering international terrorism. We try to use this mechanism to achieve practical results. I will reiterate that Russia is interested in global stability and security. It will always be a reliable ally for those states that fight terrorism using legitimate means. Al-Ahram: How do you view the prospects for Egypt joining BRICS? 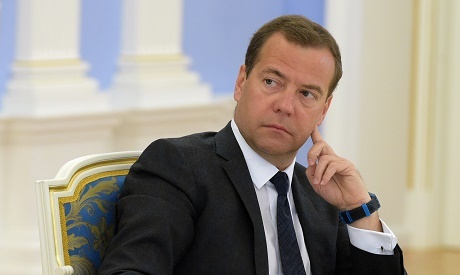 Dmitry Medvedev: The role of the BRICS in international affairs is growing. Already now, the member states account for half the world's population and 20 percent of global GDP. BRICS is a mechanism for coordinating approaches to important issues in international relations and global development. This contributes to forming a more balanced, more equitable, more sustainable and, if you will, a more democratic international system. This year Russia is presiding over BRICS. The BRICS Summit was held in Ufa. Along with the leaders of the BRICS, the meeting was attended by the heads of member states of the Eurasian Economic Union, the Shanghai Cooperation Organisation and the SCO observer states. This means that many countries are interested in joining our association, which is open to such cooperation. Outreach meetings have become commonplace during the BRICS summits. However, it’s too early to speak about expanding BRICS. The association needs to fine-tune its mechanisms and formats, which are numerous, including the New Development Bank and the Contingent Reserve Arrangement, to name a few. This does not mean, however, that BRICS will not accept new members in the future. Al-Ahram: How do you see the future of Russia's relations with Arab countries? Dmitry Medvedev: Relations with the Arab world have traditionally been important for Russia. They have a long history. Just remember that for centuries, Christian pilgrims from our country have visited Orthodox holy sites in Palestine, Syria and Egypt, and Muslims from Russia made the hajj to Mecca. Russia is one of the few world powers that has never pursued any colonial interests in the region. Mutually beneficial ties in trade, economics, science, culture and military technology have been developing quickly throughout the 20th century. Our country has done much to strengthen the economy and the defence capabilities of Arab states. Today, we are still guided not by fleeting interests but by our strategic partnership. We act strictly in accordance with the fundamental principles of international law. This is the only way to put an end to the conflicts tormenting the Middle East, and give its peoples a chance to build a prosperous and a stable future. Our country will do its best to make this happen. We have been successfully cooperating with the Gulf countries over the last 25 years in a bilateral format and as part of the Russia-Gulf Cooperation Council dialogue. As we build a relationship with the modern Arab world, we will pay special attention to Egypt, our old and time-tested partner. I’m confident that Russian-Arab relations will not only maintain their momentum in the future, but will expand in promising new areas. I’m referring to cooperation in areas such as peaceful use of nuclear energy, space research and high technology. We have much to offer to our Arab friends in all these areas. Al-Ahram: How will relations between Russia and Iran change after international agreements are reached on Iran's nuclear programme? Dmitry Medvedev: Russia and Iran have long-standing friendly relations. And now that a comprehensive agreement on the Iranian nuclear programme has been reached in Vienna, it has opened up new opportunities for deepening bilateral cooperation. Let me remind you that Russia has always insisted that the situation around the Iranian nuclear programme can only have a political and diplomatic solution. We believe that the Joint Comprehensive Plan of Action will not only help restore normal economic and political contacts between Iran and the international community, but will also ensure peace and stability in the Middle East. Al-Ahram: What is Russia's stance on the conflict in Yemen? Dmitry Medvedev: Ever since the Yemeni crisis began, we have been firmly and consistently in favour of an early cessation of hostilities, of preserving the country’s unity and territorial integrity, and of resuming a broad dialogue. In word and deed, we support the efforts being made by the United Nations to defuse tensions in the country. It pains us to see the suffering of the civilian population. And, of course, Russia cannot stand aside as this tragedy unfolds. We have already sent tons of humanitarian cargo to that country. I know that other countries are doing the same to help Yemen. In any conflict, regardless of where it occurs, it is essentially important to maintain dialogue, the ability to listen to each other and to talk. In order to stop the violence in Yemen, it is necessary to take into account the positions of all the political forces, but above all the interest of the Yemeni people, and adjust them to reach a compromise. The conflict needs to be brought on a peaceful track of negotiations as soon as possible, to end the war. Al-Ahram: Do you think that it is still possible to achieve a political settlement in Syria while Bashar Al-Assad remains president? Dmitry Medvedev: A political solution to the Syrian conflict is the only possible one. There are no alternatives. Otherwise, war and chaos will continue. Russia’s stance remains unchanged. It is important that the Syrian crisis be resolved on the basis of the Geneva communiqué of 30 June 2012, which clearly defines all the necessary steps. I would like to emphasise that we consider any external intervention unacceptable. 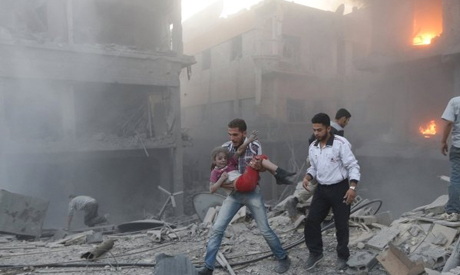 The Syrians must decide who should lead their country. Nobody has the right to do this for them. As for bilateral relations, we intend to continue to help the Syrian people deal with their social and economic problems. For us, it is important to stop the bloodshed as quickly as possible, to stabilise the country, considering how volatile this region already is. Moscow maintains ongoing contacts with officials in Damascus and representatives of the moderate Syrian opposition. It is making every effort to create a favourable atmosphere for interethnic dialogue. Moscow has hosted two Intra-Syrian Consultations, in January and April, with representatives of the government and of external and internal opposition. We will continue to organise such consultations as we believe that they have to lead to a successful resolution of the conflict in the end. One country’s efforts are certainly not enough to successfully confront the new global evil — international terrorists from the Islamic State, Al-Nusra Front, and other radical groups. This requires combined efforts on the part of the international community. Al-Ahram: What is your position on military operations against the Islamic State in Syria and Iraq? Dmitry Medvedev: Syria and Iraq are going through difficult, tragic times. They have faced a massive terrorist onslaught. The Islamic State’s aggression has already directly affected Libya, Lebanon and Yemen, and has infiltrated Jordan. The so-called "caliphate" proclaimed by the Islamic State in large areas in Iraq and Syria is a direct threat to safety, not only for the Middle East. The US-led coalition against the Islamic State provides support for the Iraqi armed forces in their fight against the Islamists. We understand that this is done with the approval and at the request of the Iraqi government. However, this coalition was created bypassing the UN Security Council and extended its activities to Syria without the consent of its government. This arouses serious doubts about the legitimacy of such action. By the way, the recent Turkish air strikes on Iraq cannot but lead to similar issues. I am confident that combining and coordinating the efforts of the widest possible range of countries under UN auspices should be at the top of the list in the fight against terrorism. As you know, the Russian president has proposed an initiative to set up an international anti-terrorist front. Secondly, national consensus in Iraq and Syria is also important to achieve. The most pressing problems in these countries can be resolved only through dialogue of all the participants in the political process.